I suppose it's inevitable that I join the national chorus of people complaining about the heat. But August and Florida have never been a good combination, so I'm not surprised. 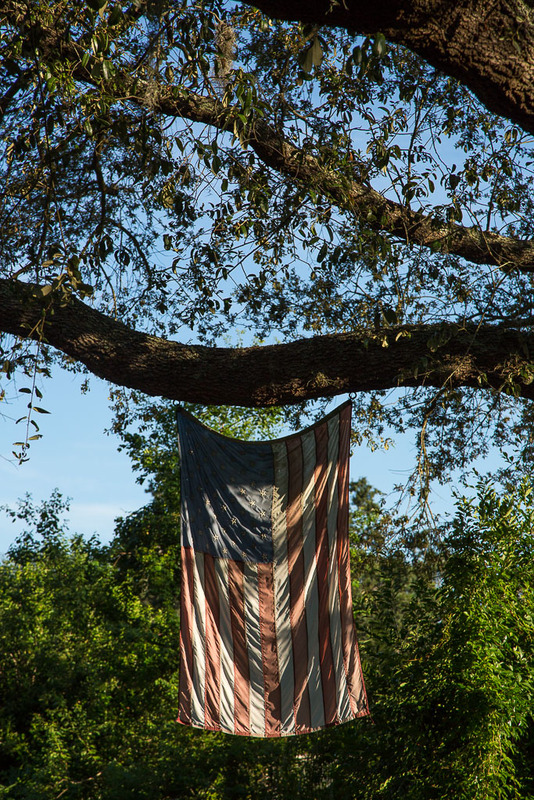 We're pretty limited in what we can do outdoors in this kind of weather -- we take little early-morning walks around the neighborhood that leave us feeling as limp and faded as this flag. 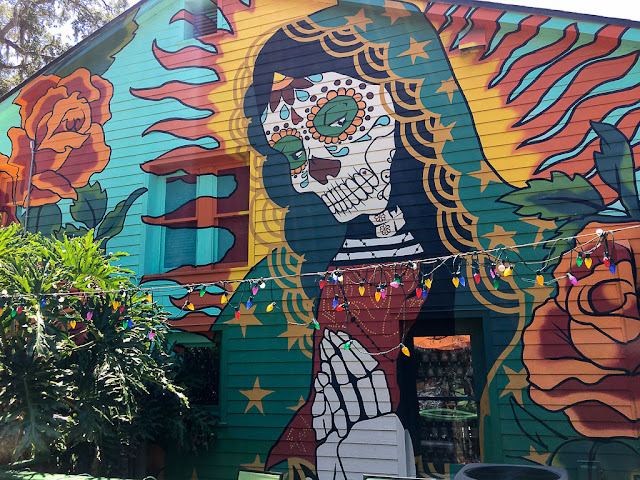 My brother, mom and I went to lunch yesterday at a taco place near Jacksonville Beach with this amazing mural on the side of the building. I got a taco salad because I feel like I haven't had any vegetables in a couple of days, but of course a taco salad isn't exactly nutritious. There was romaine lettuce and a few tomatoes, and I got some "Mexican street corn" on the side -- but it had a cheese topping. So basically, I'm living a life of no exercise and dubiously nutritious food. Welcome to America! 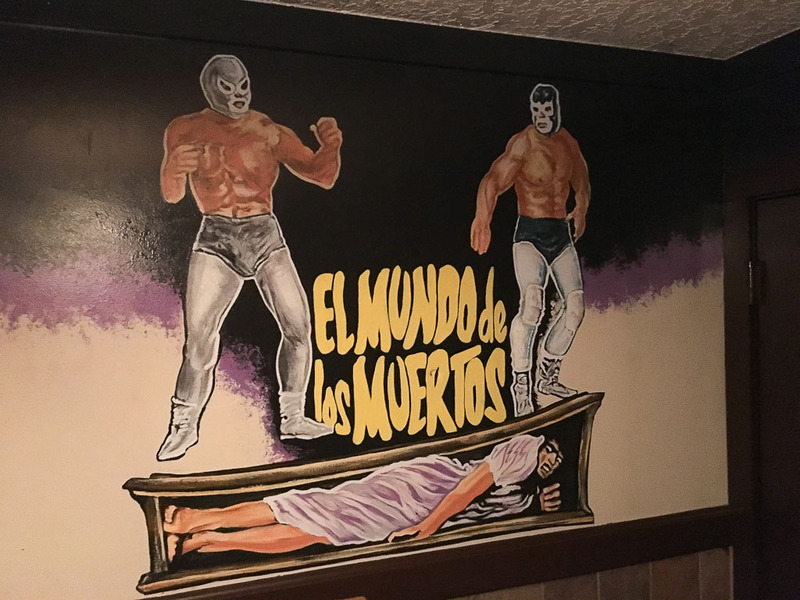 The bathrooms in the taco restaurant were painted with images of Mexican wrestlers. Or at least the men's room was. I can't vouch for what was going on in the women's. I should have asked my mom. I'm sure you don't remember -- and why would you? 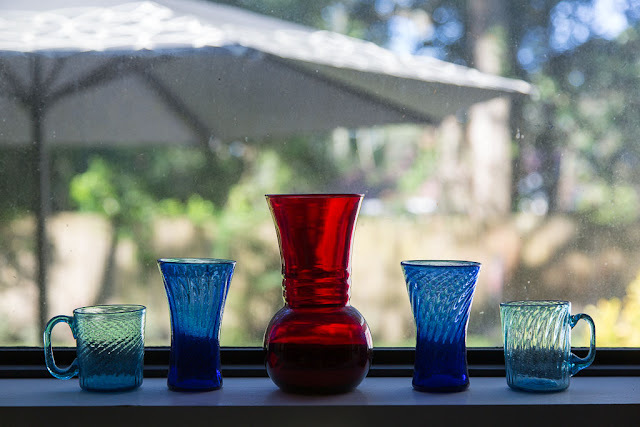 -- but this glassware was the subject of one of the first photos that I took with my first serious camera back in 1983. It used to belong to my grandmother, and then I owned it for several years, and now my brother keeps it on a windowsill in his kitchen. The blue pieces are very lightweight "carnival glass" that I think came from Cape Cod back in the 1930s. The red one may have come from there, too, but it's better quality Anchor-Hocking in a color called ruby red -- vases like that are omnipresent on eBay, or at least were the last time I looked. Last night we started out watching more Harry Potter, until my brother basically demanded that my niece turn it off so we could watch something else. (We switched to an old episode of "Miami Vice.") My older niece seems to be going through a Harry Potter phase at the moment -- she's very artistic, and she's been making wands and spell books and writing quills all sorts of Potteresque items. She still has a thing for dragons, too, and she uses the iPad to draw dragons and gryphons and other mythical beasts sitting in the palm of her hand. It's pretty cool -- I watched her produce one yesterday. She can work that iPad like nobody's business, and she's very imaginative in determining what the beasts should look like (why not a snow leopard?) and what they should be doing (blowing smoke?). Today I'm moving from my brother's to my mom's, where I'll stay the next few nights on her couch. I don't want to stay too long in any one place and wear out my welcome! At least I had the good sense to replace the wine I drank at my brother's, which as far as I'm concerned is pretty much the cardinal rule of visiting anyone. Kids are so proficient and comfortable with technology. They've never known a world without it. It amazes me even as I understand the "why" of it. That bathroom mural with the woman in the - what, a box? a coffin? - makes the hair stand up on my neck. Are you sure they are wrestlers?! I would guess you are a model guest, which is the secret to being invited back! If I were in Florida right now I would go for a good, long swim - hopefully somewhere without alligators. Did you remember to pack your Homer Simpson swimming shorts? I looked for you as I usually do, on my iPad in the middle of the night (I'm always awake at 3am) and you weren't there. Then I remembered that you are temporarily blogging in the same time zone as all us Americans here on the north shore of Long Island. Cool! It is interesting to me that your Grandmother and your brother display the same items so differently. I like your Grandmother's jumble. Is your brother by any chance a Virgo or a Capricorn? They like straight lines. My husband and I were going to go to Apalachicola this month but then we also remembered that Florida in August is abundantly sweltering so we decided to stay home and for a week do the things that we never get around to doing locally. But I will miss going to the Waffle House at the wee hours -- I was looking forward to checking this genuine Southern experience off my Bucket List. Vivian Swift made the right decision. Apalachicola in August is not a treat. She should wait until November. And there is no Waffle House there but there are certainly plenty of them in Tallahassee. Isn't this heat ridiculous? That flag is definitely the perfect symbol for Florida right now. On the other hand- that mural is wonderful! Taco salad is one of those salads in name only. But hey- it's generally tasty. You could go to Publix and get some cut-up watermelon. They have some pretty good salads there now too. one of the apps I had on my iPad that went dark was a drawing app. it was a very cool app that I used only rudimentarily but my two granddaughters used all the tools and gizmos and attributes and did some amazing drawings. me, I still prefer pencil and paper. I love the mural. I have to get out house painted and wouldn't it be fun to do something like that on the house? I won't though but I am considering using at least three colors. August is pretty brutal here too. sounds like you're having a great family visit, your niece is very much like our granddaughter, Harry Potter is such an attraction to the young ones. The murals are amazing work! Staying a short time with each family member is a great idea, and replacing wine is a good idea as well! That was an attention getting title to your post. I'm glad it was a mural and not real wrestlers. I love that photo of the glass in the window. I really love colored glass. It brings back childhood memories. I still have one piece that used to be in my grandmother's glass collection. I bet the heat there feels very stifling. Heat and humidity are not a nice mix. You are a good guest, you can stay with us anytime! I agree with Sharon about the heat and humidity being a killer. I can tolerate our high summer temperatures much better with our normally dry climate. Since Sharon is in Phoenix, it's probably the same with her. I'm pretty sure you can't wear out your welcome at your mom's place. As for Harry Potter, my daughter discovered the books late, when she was 15 and bored one summer, and then she read them straight through. For a couple of months I always knew where she was, in her room or on the living room couch reading Harry Potter. Later, she told me she didn't do drugs in high school because Harry wouldn't have approved. She eventually went to college at Cornell in part she said because one of the libraries and some of the buildings looked just like they should exist at Hogwarts. Combine that with the fact that the first Harry Potter volume was the very first book my late-to-reading son had enough interest to master, and you'll know that I am a big HP fan. We go through periods of watching the movies back to back over here, too. After spending over a decade in southern Louisiana, with the heat, humidity and bugs and snakes, I don't ever, EVER want to go back "down south"! That was one of the hardest things for me to get used to in Florida, the scarcity of decent Mom and Pop restaurants that served fruit and veg. It seems like you can get french fries and coleslaw everywhere, but it's not going to help one live a long life. You're having a variety of experiences during your Florida stay. Weird mural for the mens' room. The 'muralisto' has a definite leaning towards death & violence. What a cheerful place to visit for a meal! I dread to think what the mural might be in the the Womens bathroom. Jenny-O: The image of the wrestlers with the coffin comes from the movie poster for a 1970 Mexican film called "Land of the Dead," about two wrestlers who have to save the world from a zombie invasion. ( https://www.imdb.com/title/tt0064933/ ) I only learned this myself after you asked the question, so thanks for asking! YP: Yes, that flag DOES seem to illustrate our current state of affairs. Sad and faded and tired. Vivian: Actually, I repositioned the glass in my grandmother's window for my earlier photo. She kept it in straight lines, too. This is definitely not the time of year for Apalachicola, although I'm sure they're hungry for tourists and would be thrilled if you showed up! Ms Moon: I love that mural, too! You can only barely see the top of it from the street -- you have to be at the back of the restaurant to see the whole thing. Ellen: I wonder if it's the same drawing app my niece uses? She moves so fast she's like a blur. 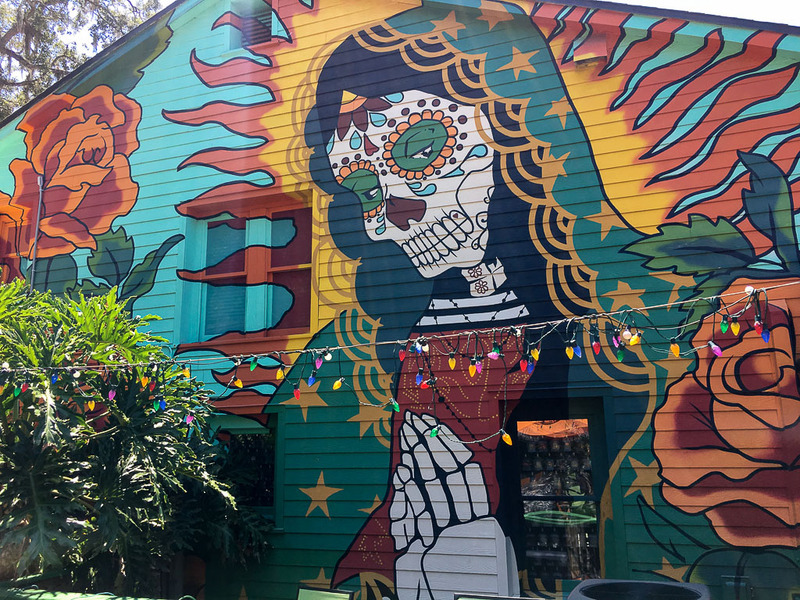 Yes, a mural like that would be AWESOME on your house! I say do it! Laurie: Yeah, kids are still captivated by Harry Potter! And I can see why -- it IS a very richly portrayed world. Sharon: My grandmother had some other pieces of colored glass too, and I always wish I'd taken more of it. Catalyst: Yeah, the dryness helps A LOT! 37P: It's nice to hear this perspective, because I have to admit that as good as the HP books are, I get frustrated by how monomaniacal some kids are about reading them and ONLY them. It's very hard to get some kids to move on to other books and other experiences. My brother and I talked about the need for my niece to experience some more realistic movies and fiction. Peace Thyme: Oh yeah, and southern Louisiana would definitely be THICK with both heat and bugs!! Colette: There used to be more of them (which is probably true everywhere) but Florida has become the land of chain restaurants, it seems. Alphie: Skulls and skeletons are a huge part of Mexican folk imagery, given their Day of the Dead celebrations. I think the bones are supposed to be happy and celebratory rather than forbidding, although I'm no specialist in Mexican culture. (Ms Moon would know more.) See my response to Jenny-O above for the backstory on the men's room mural! Thanks for the extra info, Steve. I wondered after I posted my comment if that painting had anything to do with the Day of the Dead celebrations (once I read the Los Muertos bit)! That would explain a lot.